While the video might not line up perfectly with the gun violence-referencing lyrics of Majical Cloudz' "Childhood's End," off their impending Matador Records debut Impersonator, it is just as bleak. 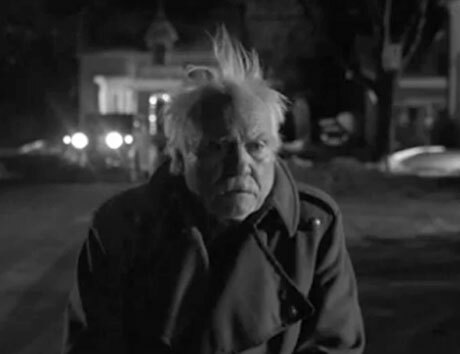 The black and white clip stars former Twin Peaks actor Kenneth Welsh — who is actually the father of Majical Cloudz' Devon Welsh — as a man trudging through a lonely existence. We see his life teeter back and forth from soup-for-one meals and uncomfortable staring contests with supermarket patrons to the occasional flight of inspired artistic fancy. Fittingly, Majical Cloudz's low-key synth-and-strings arrangement plays melancholy, with Devon Welsh's vibrato tenor wringing out every ounce of emotion it possibly could. As previously reported, Impersonator hits retailers May 21.